As clients manage their need for reliable communications for storage access, host communications, and server clusters, three types of networking are common to modern data center infrastructures. Fiber Channel (FC) Network Switches are common for storage platform data access, while Infiniband Network Switches commonly manage cluster node inter-communications, and finally, common Layer2/Layer3 TCP/IP Network Switches are used for natural, WAN based, host communications. This opens the door for an updated protocol for storage. Today, iSCSI offers an opportunity to leverage less expensive networking to reduce the cost of a fiber channel infrastructure while still achieving the requirements of block volume management on any host. iSCSI works by passing block-level data between iSCSI initiators on client-servers and iSCSI target storage devices. The iSCSI protocol simply encapsulates SCSI commands into “packets” that are transported over common WAN-based, TCP/IP networks from clients to servers and servers to clients. The receiver of the packets then un-encapsulates the packets transforming them back into common SCSI commands. iSCSI has been around for some time and has matured into a reliable protocol solution. As companies grow their managed data and application services, so grows the cost and complexity of required networking resources. One trend in the industry involves a push to lower the cost and complexity of networking infrastructure requirements by simplifying the network requirements, or essentially reducing the disparate types of networks supported. We have seen this push by the expansion of applications supporting NAS shares or exports for data management, as well as a recent growth of iSCSI deployments among cloud and service providers. NAS and iSCSI use common TCP/IP networks for data access and management. This remains a networking solution that has no visible end in sight, as this is how clients and servers communicate around the world for normal WAN based communication. Common TCP/IP networking continues to evolve to higher performance, reliability and ease of management. Today, it simply makes sense to do more with it. Companies like Brocade and Cisco have focused on building dramatic improvements in TCP/IP network switching reliability, performance and management over the past ten years. Now we find much practical use for common network infrastructures for mission critical business data communications where fiber channel networking once dominated the core infrastructure requirements. By building out the network bandwidth and reliability of TCP/IP networks, our clients are able to reduce their requirements for these very specific purpose-built FC networks, while reducing budget and management commitments to support storage access and simply use the networking already in place. One client suggested that by removing the FC Fabric communications and exploiting beefier TCP/IP networking, they save roughly $3500 per server. The growth of virtualization in the data center also simplifies the rationalization for moving to TCP/IP based storage management. 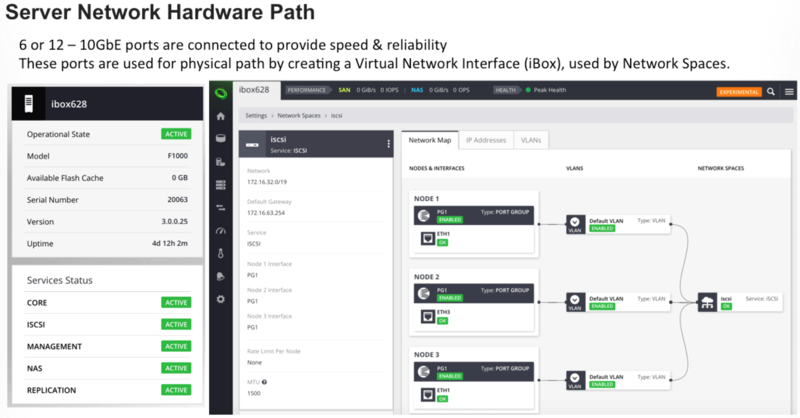 In addition, with highly reliable, high bandwidth networking, as well as extremely efficient and reliable storage platforms, the decision to follow this trend is safely based on cost and infrastructure simplicity. It is safe to say that this trend is growing and all predictions indicate it will continue. Recently INFINIDAT announced its version 3.0, which introduces several new features, including a rich and full-featured implementation of iSCSI as a peer protocol to its FC and NFS protocols. INFINIDAT 3.0 now offers the ability to use iSCSI protocols for storage access with the InfiniBox. We have introduced this feature to our storage with a refreshing simplicity, extreme reliability and superior performance, and we have done it without a penny of additional transferrable cost to our customers. Even with the addition of iSCSI, our pricing model remains “All-Inclusive” for all the features of the InfiniBox. Along with the iSCSI enablement, clients will enjoy the inclusion of performance penalty-free compression and advanced performance analytics, all at no additional cost. 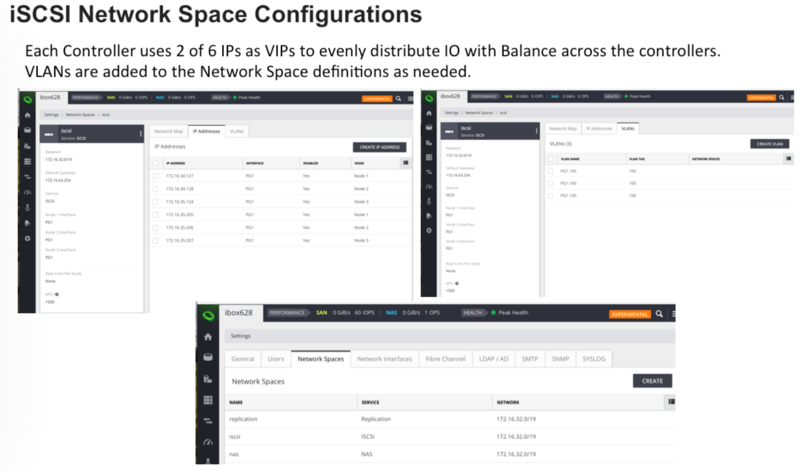 Though the process of a simple non-disruptive upgrade, clients will gain access to the new features which allows them to very simply create an iSCSI network interface on the InfiniBox and begin to map client hosts to block volumes thru FC and/or iSCSI. All features are supported by the HTML5 UI, our intuitive CLI, or Restful API’s. All of the features offered by INFINIDAT Block from FC are now available with iSCSI. INFINIDAT iSCSI supports scalable block volumes of 1GB to 2.76PB and allows you to manage growth of well beyond 4PB of compressed data from a 42U rack. InfiniBox is the greenest storage on the planet with a common TCP/IP network infrastructure. InfiniBox iSCSI is not a bolt-on protocol! Our implementation has been carefully designed and implemented to run in our highly efficient TCP/IP stack from user space across three Active/Active/Active controllers. InfiniBox offers smart distribution of IO and services in a way that is completely self-balancing, self-healing, and dynamically scales to provide the highest confidence in storage management in the field today.